If there is one stereotype about Italians that is true, it is this: Italians love to talk about food. Snatches of stolen conversation carry sentences like, “and then add the parmigiana, un filo of olive oil, and put it in the oven,” wafting through the air like the scents of dinner cooking. If you’re eavesdropping and notice the shouting, the grand gestures, the scenes that look like arguments, don’t be alarmed: there’s a good chance they’re just discussing the best way to cook eggplant parmigiana. Lately, the food-word on the street in Piemonte is all about the vendemmia (grape harvest) and hunting for tartufi (truffles – the mushroom, not the chocolate). Fall is the season for these treasures. All this talk about seasonality reminds me of how Italians instinctively respect and elevate it in their cooking, something that was perfectly illustrated for me with porcini mushrooms and snails not too long ago. The ragazzo and I traveled to Borgo San Dalmazzo over the summer to escape inferno-like temperatures during Europe’s heat wave. We thought being closer to the Alps would be cooler. It wasn’t. The hiking was hot, hazy, and buggy, so we biked instead, which was breezy until we stopped and were drenched in sweat. The whole trip, while not exactly stressful, was also not the respite we were hoping for. 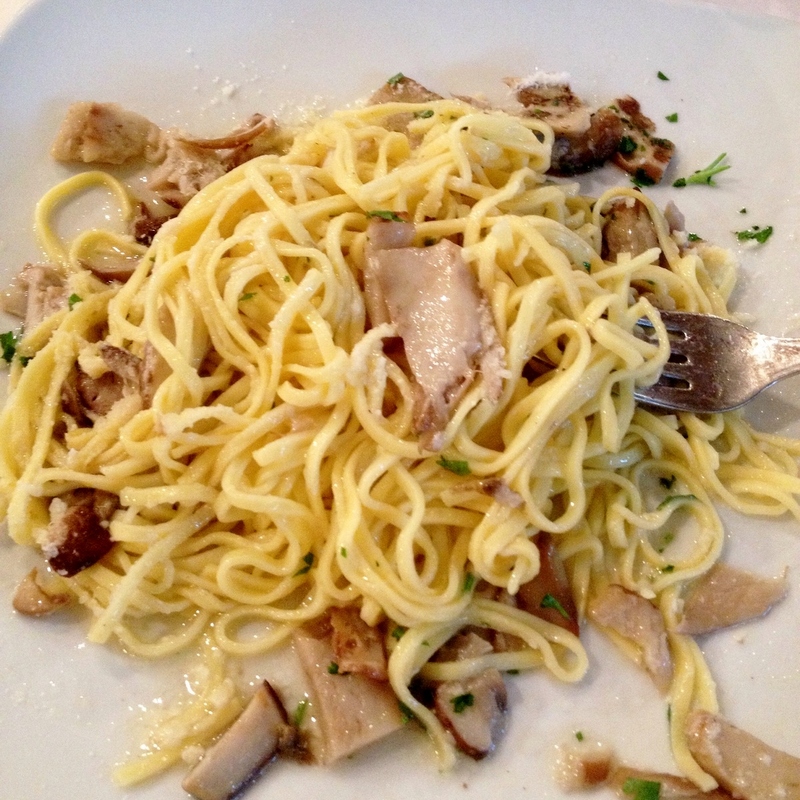 But it was worth it for dinner at Trattoria La Pernice (Via Valdieri, 52, 12011 Borgo San Dalmazzo). Okay, so my food photography may not be professional, but memories of that dish still make my mouth water: it is a tagliata di manzo, beef steak, smothered in just-cooked porcini mushrooms. Back up a course. For primi, the ragazzo ordered fresh tajarin pasta (a Piemontese specialty) with porcini mushrooms; I ordered green gnocchi with local Raschera cheese. It was all washed down with a crisp Langhe Dolcetto. The dinner, and particularly the tagliata, was “incredible!!! !” (as my nerdy foodie notes from that evening helpfully describe – maybe it was the wine that had me so descriptive?). The porcini had an intense flavor I’d never tasted before. What made this evening shine, however, was the restaurant owner – porcini appassionato and expert snail hunter. The restaurant is renowned for its wild-harvested mushrooms and snails. After dinner, I asked if the porcini were all wild-harvested. At the very least, I thought, some of these porcini were cultivated. And of course, this close to France’s border, he had an opinion about porcini found over there. “Their flavor is not as intense when they’re from France,” he said, as any self-respecting Italian would. 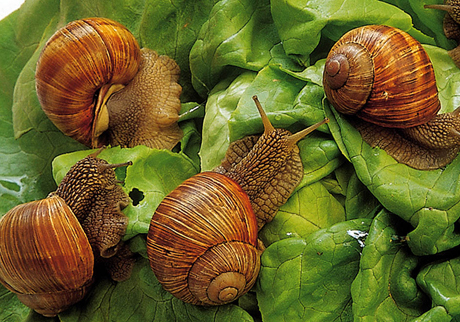 The small town of Cherasco in the Langhe is famous for its snails that are available year-round. At La Pernice, he said, they only serve them in the winter, starting in late November and finished in January. This is because the colder months are when the snails are sleeping. “Then when you cook them, they aren’t all tense and stressed out,” (poor things). “But sometimes they wake up. When that happens, we let them go again.” They gather snails in the summer, fatten them with aromatic herbs and Alpine vegetation, and plop them in the cooking pot in the winter. Besides this seasonal and apparently temperamental difference with Cherasco, the lumache – snails – from around Borgo San Dalmazzo are bigger and whiter. The area is famous for its snails, and even hosts the Fiera Fredda della Lumaca – the Snail Fair – since the 1500s. According to prodottitipici.provincia.cuneo.it, the Helix pomatia alpina, commonly called the Mountain Snail, has developed in this southwest corner of Piemonte near the Cuneese and Marittime Alps. This special method of gathering the snails and fattening them up with selected aromatic herbs goes back at least to when the monks lived in the Abbey of Borgo San Dalmazzo. I’m curious to taste the differences in texture and flavor; in Cherasco, the snails seem to be a cross between mussels and mushrooms. They’re not slimy and not too tough, though have a definite chewiness to them. I guess I’ll have to wait until this winter before tasting the sleeping snail victims of Borgo San Dalmazzo. Then, the owner smiled and said he had four pet snails kept in a little gabinetto, or cage, back at his home. Strictly not for eating. Really nice post, it’s such a shame porcini are so hard to find in the UK (another reason to visit Italy at every opportunity)! Thanks! 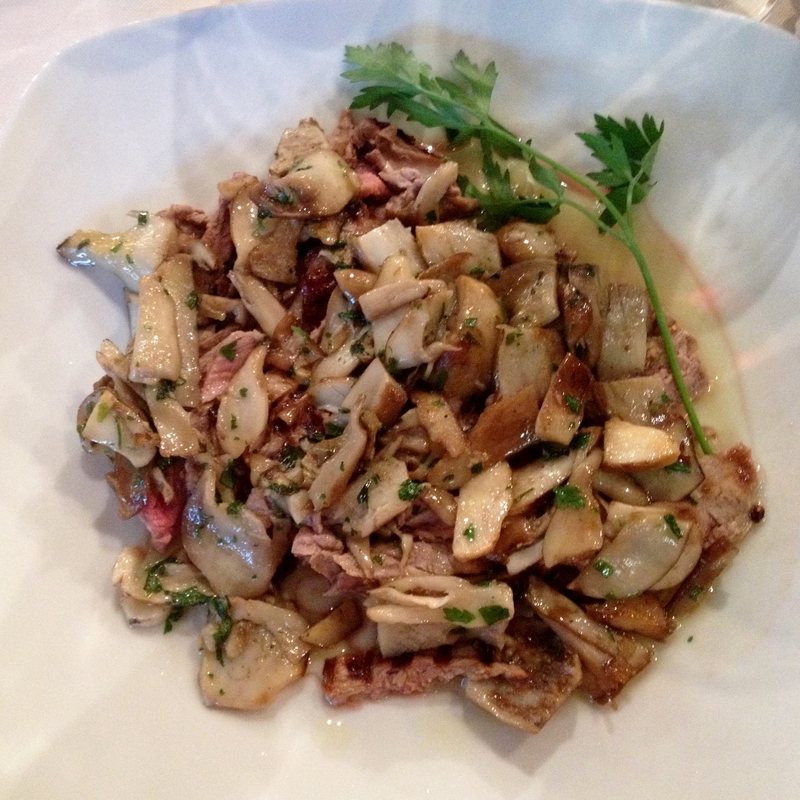 I was surprised by the sheer amount of porcini in my dish, so they must be pretty abundant in that area. Yeh they are pretty scarce over here but were on menus everywhere when I was staying on Lake Como on August! Dried they are great but you can’t do the same things with them! I’d love to cook snails (my Dad’s hometown in Calabria is famous for them) but TP isn’t keen on them unfortunately. Porcini are another story though and fingers crossed the rainy and damp weather got their spores growing! I enjoy eating snails, but I’m not sure I’d like to cook them alive 😦 Also, I’ve never noticed them being sold around here. Do you know how to hunt for porcini? I’d love to venture out sometime and gather them myself! No I definitely haven’t seen them here in Turin. 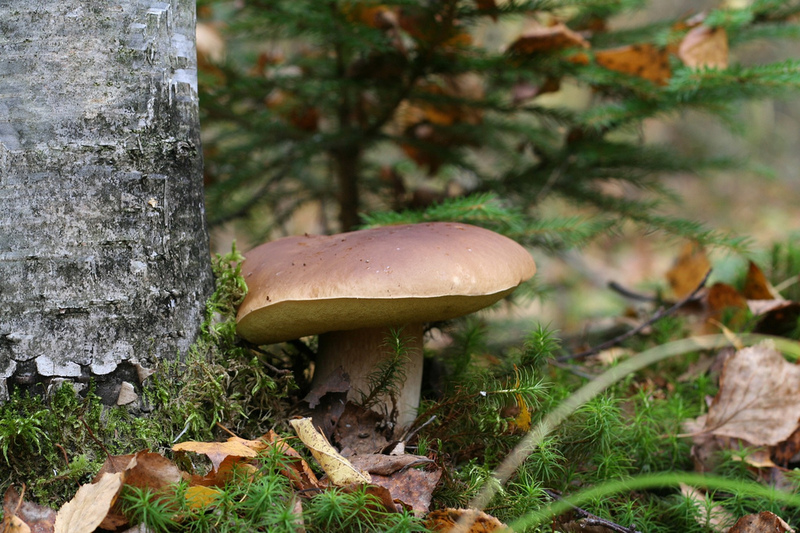 Looks like I’ll have to venture out to Cherasco instead… I love mushroom-hunting. Have so many fond memories of this growing up back home. In Australia, there are no porcini unfortunately. We used to pick saffron milk caps instead. I’ve been porcini hunting here a few times in Piedmont (in the Val Chisone mostly) with TP and a mushroom fanatic neighbour of my in-laws. You should always go with someone who’s experienced and knows mushrooms well. You also need a permit to pick them and shouldn’t exceed picking more than 2 kilos at a time if I remember correctly. I’ve been told a great porcini-hunting place is Ceva on the Piedmontese-Ligurian border. That combination of sea and mountain air makes for porcini in abundance! Isn’t it so true about italians and their seemingly constant discussions on food? On the shuttle bus over to the Expo, two women were discussing how to make a particular risotto, and they were getting loud about it! My husband and I had to bite down on our lips to keep from laughing.